cream cheese | This Girl’s Gotta Eat! My hubs fam makes a delicious Easter bread similar to the Italian sweetened bread, Panettone. This thick, dense bread is just perfect for baked french toast! And because the bread itself it already sweetened, you don’t need extra sugar. To make this casserole more savory for dinner, I topped it with breakfast sausage browned with a little cayenne before baking. Love enjoying breakfast for dinner, especially when leftovers can be gobbled up the next morning too! Butter the bottom and sides of a 9×13 casserole dish. You could also use non-stick spray. With a whisk, beat milk, eggs, vanilla, cinnamon and salt in a large bowl until combined. Add the cubed bread and toss to combine. Pour bread and liquid in the greased casserole dish and add dollops of mascarpone or cream cheese all over and in between the bread. It doesn’t have to be perfect and if the bread starts to tear and get mushy don’t worry about it! Cover with foil and store in the fridge overnight, or at least 8-10 hours. Brown the breakfast sausage with a little cayenne pepper, breaking up in small pieces as it cooks. Store in a covered container in the fridge until you’re ready to bake the casserole. When ready to bake, top the casserole with the browned breakfast sausage and preheat the oven to 350. Bake uncovered for 50 minutes to an hour. I keep the sausage separate and only add to the top (rather than mixing it in) to keep it crispy, which adds another layer of texture to the baked french toast. Top with your fav maple syrup before serving (my go to is organic maple agave syrup). 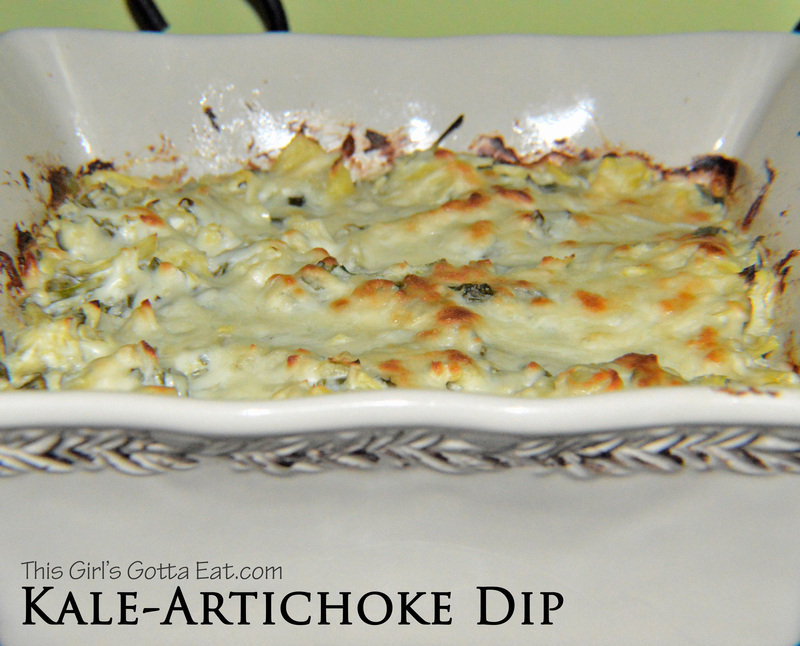 Here’s a simple and unique artichoke dip that features kale rather than spinach. This healthy dip whips up fast, and is great for diving into on game day! Preheat oven to 400. Spray a 1 and 1/2 or 2 quart baking dish with non-stick spray. In a large bowl, combine the artichokes, cream cheese, yogurt, 1/2 cup Italian cheese blend, parmesan, kale, garlic and lemon zest. Season with salt to taste and mix well until everything is combined. Pour the mixture into the prepared baking dish. Cover with foil and bake for 25 minutes. Stir and bake, covered, for another 15 minutes. Remove from oven and add the remaining 1/2 cup of Italian cheese blend. Bake uncovered, for another 5-10 minutes until the cheese is melted and beginning to brown. Serve with multi-grain chips and sliced veggies such as celery and carrots. And here’s one more idea for you….in case you have extras, try heating this up the next day and topping it on quick sautéed chicken! Categories : Entice, Meatless, This girl has recipes! I have more cream cheese leftover from the twice-baked potatoes I made last weekend than I know what to do with at the moment! So I turned to Pinterest for inspiration and found my way to this cream cheese based sauce with roasted red peppers, which inspired tonight’s dinner. By using my Vitamix, this delicious and healthy sauce with a kick came together super fast! Drizzle chicken with a little olive oil and a little salt. Grill on high heat until cooked through and juices run clear, 6-8 minutes per side. Remove and tent with foil to rest. While the chicken is grilling, add whole red peppers to the grill and char on all sides. Remove to a bowl and cover with plastic wrap to trap the steam. Once cool enough to handle, peel the charred skin away from the pepper, cut in half and remove the seeds, then you’ll be left with roasted red peppers. Add roasted red peppers, cream cheese, chicken broth, garlic, red pepper flakes and a pinch of salt to a high-powered blender. Pulse until smooth. Transfer mixture to a large skillet and cook over medium-high heat until bubbling, stirring often. Taste and adjust seasoning as needed. Reserve a little of the sauce to top the chicken before you add the pasta. Meanwhile, bring a large pot of salted water to a boil and cook pasta to al dente, according to package directions. Drain, and add pasta directly to the skillet with the warmed sauce. Continue to cook another minute or so. Add parsley and toss until well combined. The sauce might seem a little thin at first, but it will thicken as it sits. 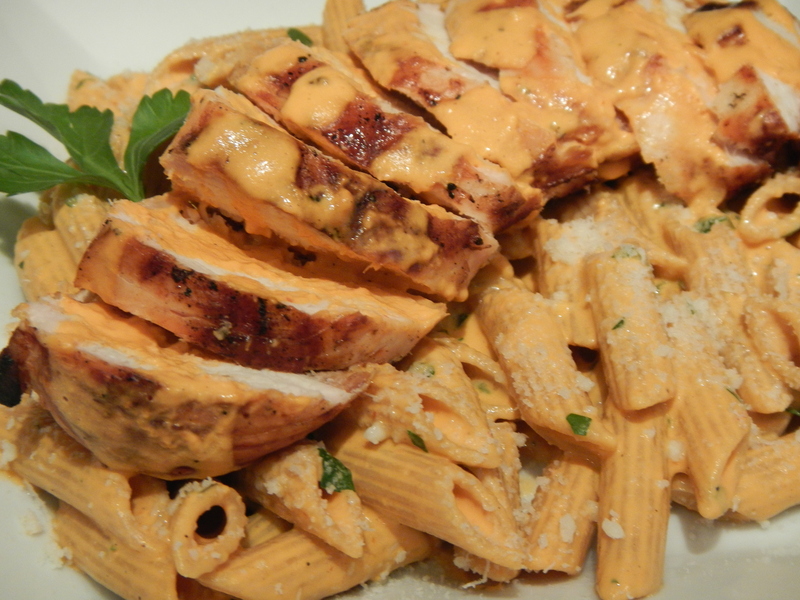 Slice the chicken and serve over pasta topped with parmesan, and a little more sauce. 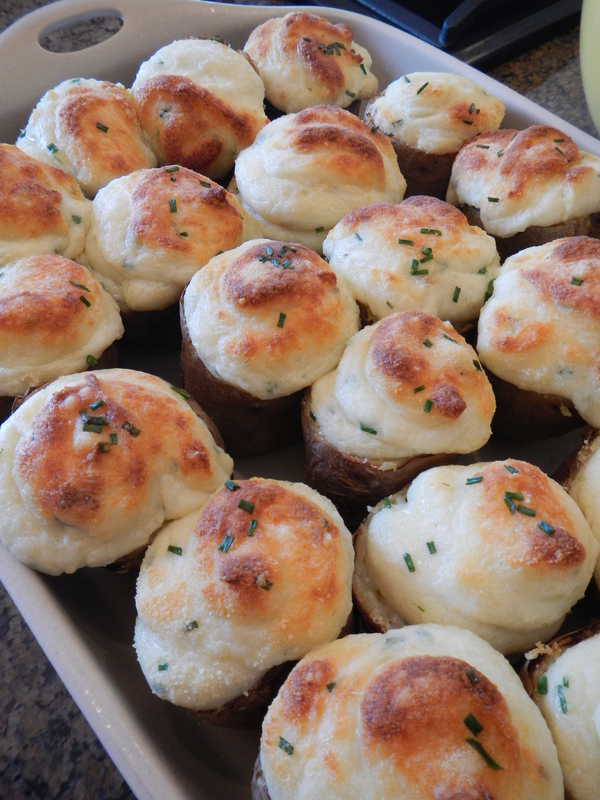 I served these fancy looking twice-baked potatoes at my family’s Easter dinner this past weekend, and they were a big hit! Deliciously creamy and so pretty to look at, they can be made ahead of time which is helpful when you’re cooking for a dinner party. Although I made 30 servings for the fam (that’s a lot of potats for real! ), the recipe below is for two servings. Bake potatoes directly on the oven rack until tender, about 1 hour. Trim off potato ends evenly so they can stand up easily. Then halve the potatoes, and let them rest until cool enough to handle. Using a small spoon, scoop out potato flesh from the four halves into a bowl, leaving 1/8-inch on two of the halves, you can discard the other two halves. Scoop out the flesh slowly to ensure the skins don’t crack. Mash/puree the potato flesh until smooth using a hand blender or immersion blender with 1/2 cup parmesean, the cream cheese, butter, zest and the chives. Season filling with salt and pepper to taste. If the mixture looks too dry, you can add a splash of cream or milk. Spray the inside of a Ziploc bag with nonstick spray. Add the potatoes to the bag, seal and cut a small tip off the corner of the bottom of the bag. Pipe the filling back into the potato shells in a swirling motion so that it almost has the appearance of soft serve ice cream. Top with more parmesan and chives. At this point, you can chill the potatoes until you’re ready to serve. Bring them back to room temp before baking. Bake potatoes on a baking sheet or pan until heated through and starting to brown on top, about 15 minutes. Found this idea on pinterest and was excited to try it for Christmas dinner. Stuffing and forming is a little time-consuming when you’re making for a crowd, but I like serving mini desserts like this at dinner parties, so I thought it was worth it. Mince apples with a knife or process them in a food processor with a chopping blade. In a medium size bowl, mix flour, cinnamon, and sugars. Whisk lightly with a folk to combine. Add apples and bourbon; mix again until apples are well coated. Heat butter in a medium sauté pan over high heat. Reduce the heat to medium once butter is melted and sauté apple mixture, about 5 minutes. Stir constantly with spatula to prevent from burning. Turn the heat off and set aside. You can make the mixture a day in advance and store covered in the fridge at this point. Put 1 cup of water in a shallow bowl. 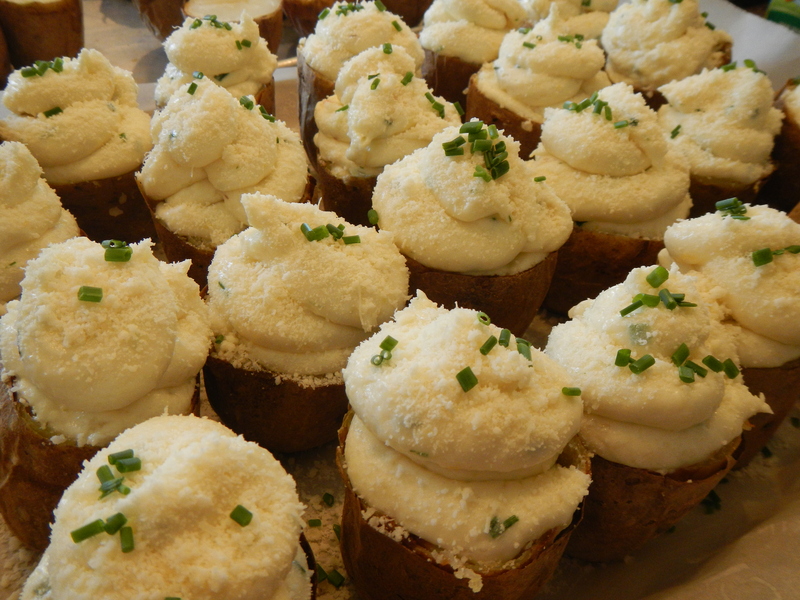 Place 1/2 teaspoon of cream cheese, then 1/2 teaspoon of apple mixture on top of cheese. Dip 2 fingers in water and wet all edges of wonton wrappers. Fold the wrapper over to form a triangle, then press edges to seal. Place filled wontons on lightly oiled cookie sheet. Using a pastry brush, brush some egg wash on top. Bake them for 15-20 minutes in preheated oven until golden. 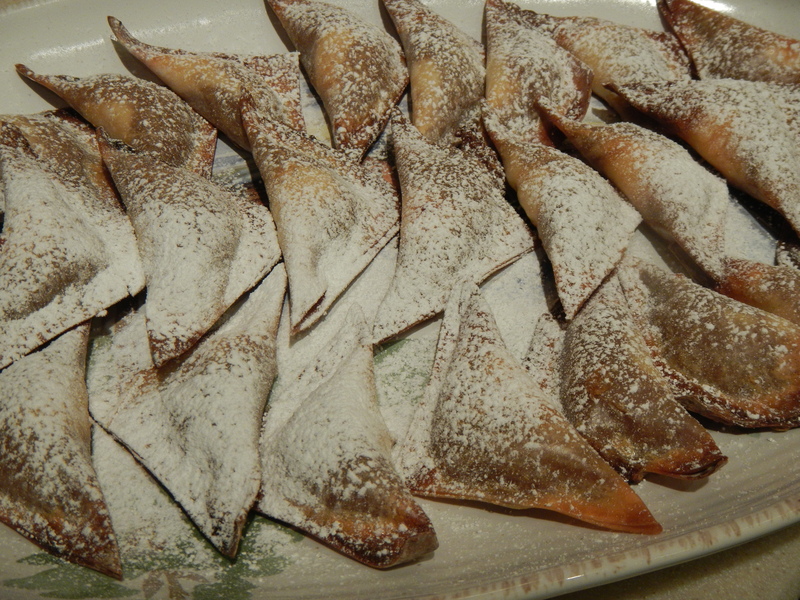 Slightly cool wontons at room temperature and dust with powdered sugar.